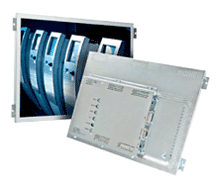 Industrial LCD Panels with control unit (VGA, DVI, DisplayPort or Single Board Computer) for several fields of application, individually configured PC systems are our main competence. If you need an individually adapted TFT display-solution, distronik configures the most appropriate components for your personal applications. distronik can also develop an industrial monitor for your individul requirements. Customised monitors for industrial fields of application. 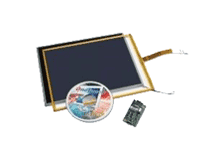 TFT Displays 5,5" - 27"
distronik only markets premium LCD products by well-known manufacturers like Innolux, AUO, Annax and Ampire for your individual demands. Every fabricator has his own technical features and abilities in relation to contrast, resolution, MVA, TTL or even semi-customised TFT panels. Our TFT LCD`s are available in several variants according to the screen size (5.7 inch – 27.0 inch) or to the resolutions (VGA - Full HD). 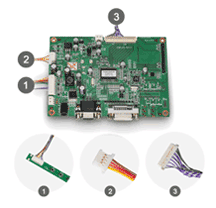 We also offer the necessary accessories such as LCD Controller Boards, LVDS and backlight cables or entire Industrial Display Kit`s. 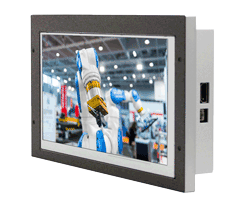 The industrial TFT monitors, engineered and produced by distronik or within our company group are perfectly designed for POI-, automation- and machine control applications. The screen diagonals of our premium industrial monitors range from 10.4 up to 27 inches. Every industrial monitor is equipped with innovative LED technology for lower power consumption and great picture quality with high contrast. 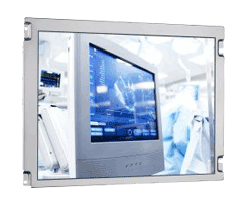 The industrial LCD monitors are available in various versions like: VESA, Rack- & Panel-Mounting or super slim Open Frame Panel. 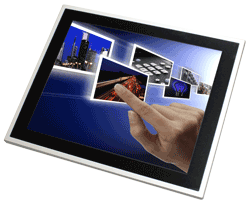 Touchscreen panels are deliverable with numerous technologies lik e resistive / capacitive touch or 5-wire / 4-wire technology. Whether you need touch sensors or completely assembled touch-systems with display - distronik helps to find the best solution. 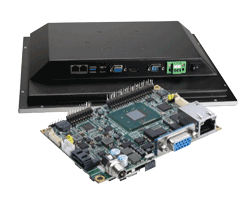 Single-board computer, Panel PCs and Embedded Box PCs for rough industrial usage & Digital signage applications. Take advantage of our competences! We combine industrial flat panel displays with modern embedded computer systems and Single-board PCs.